“The Economy Matters” reports are the first and only research report that shows you how your investments relate to the economy. 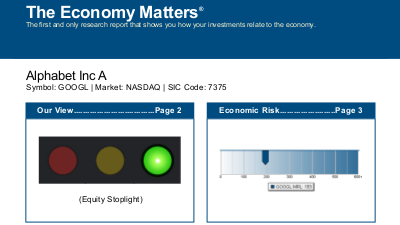 Each report features our proprietary risk measures, including overall economic risk and our Economic Climate “Star” rating. It also relates these measures to other assets and the market as a whole. These reports are available from Thomson-Reuters, Capital IQ, FactSet, and selected MacroRisk.com subscriptions. You can find “The Economy Matters” Reports on over 30,000 company stocks, mutual funds, exchange traded funds, and indexes. No other provider we know provides such extensive coverage. If a company or fund has three years of trading on a major market, we’ve got it! Our risk measures incorporate risk from 18 different macroeconomic sources, including interest rates, world equity markets, inflation, and monetary values. It also includes a carefully selected sample of other statistics which explains over 85% of the price movement of over 95% of stocks traded on the major US exchanges. Our reports have measures that give you insight into the Five Risks that impact your portfolio. Besides economic risk, they also include measures for momentum risk, firm-specific Value at Risk, market risk, and “black swan” risk. our “Beta+” market risk section provides detailed CAPM information, including standard statistics, but also up-market and down-market statistics, including alpha, beta, volatility, r-squared, and tracking error information.